Breaking the Surface is a chapbook of poems published by Janet Taliaferro. The poet writes about the lake house in Northern Wisconsin where she spent summers in her youth and that she still shares with her family. Readers will discover poems of memory and place—their totality encompasses the arc of a life lived. 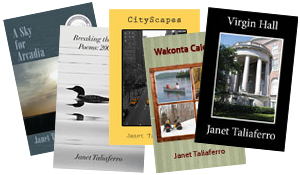 Janet’s poetry is much admired by readers and poets alike for her clear vision and vibrant imagery. Breaking the Surface, a poetry chapbook by Janet Taliaferro, finds inspiration in the Northern Wisconsin lake house where the poet spent summers in her youth and that she still shares with her family. Filled with poems of memory and place, the collection encompasses the arc of a life lived. Breaking the Surface combines poetry about nature, human motivation, conflicts, and resolutions—all connected to the place a family recognizes as their spiritual home. The poems are informed by life experience, alternately bringing loss, love, and laughter to light and to life for the reader. The poet’s family history grounds her work firmly in the day-to-day while recognizing the power of longing and dreams. “The summer of 1941 seemed a world away from the wars in Europe and Asia that would soon consume all of our time and attention. That July, while our family visited one of my father’s relatives in Michigan, my mother received a call that her father had suffered a heart attack in Minnesota. My parents chose the shortest route to reach him, and that route took us right through the North Woods of Wisconsin. Her statement finds a home in Breaking the Surface, just as four generations of the Taliaferro family has found refuge, comfort, and a connection to nature in the house she wanted on the lake that so captured her imagination.